Beyond Baked » Moist and sweet gluten & refined sugar free muffins. Chocolate chip or blueberry. 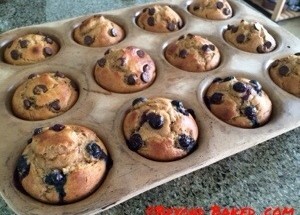 Home Blog Moist and sweet gluten & refined sugar free muffins. Chocolate chip or blueberry. Grease muffin pans with butter or line with natural liners. Preheat oven to 400 degrees fahrenheit. In the mixer or food processor mix the peanut butter and bananas. Now add the vanilla, cinnamon, nutmeg, honey and coconut nectar. Mix until well combined. Add the baking soda and vinegar last, mix it in and move to greased or lined muffin pans right away. I fill the muffin cups 3/4 of the way full and then push the topping in from the top. This way I can regulate the amount in each muffin and about where there are placed. (I like things to be even) If you prefer you can just fold them into the batter after it’s mixed. Bake at 400 degrees for 14-16 minutes. Wait until the top starts to brown.